What exactly does the term “Creole” mean in cooking? The answer is that the dish usually contains celery, bell pepper and onion. Classic Creole (and Cajun too, a rustic country cooking) dishes such as jambalaya, etouffee and gumbo all begin with this “holy trinity”, so called because the combination is so revered in the Creole culinary culture. Trinity combinations are what give dishes their signature renown and can be found globally. The differing aromatic vegetables plus the herb and spice seasonings are what set each culinary group apart. For instance in Portuguese, Italian and Spanish cuisine the three-ingredient combo is called a “soffritto”. Some trinities are so common and time-honoured that they are treated as a single entity. In France where cooking was developed into a high art, the trinity “mirepoix” is celery, onion and carrots with a an additional trinity for soups and stews called a “bouquet garni, consisting of parsley, thyme and bay leaf. In Hispanic cuisine, the trinity is garlic, bell pepper (capsicum) and onion. 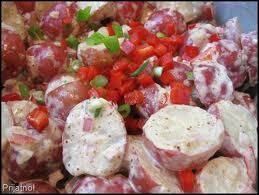 What makes Hungarian cooking distinctive are the triple ingredients lard, paprika and onion. This trinity theme is worldwide. In Asia there is garlic, ginger and onion found in some Indian regions, and garlic, shallot and chili peppers in Indonesia. In Greece, lemon juice, olive oil and oregano is the trinity. The Creole culture had the local trinity ingredients to call on and the shoulders of different cultures (Europe, Africa, the Caribbean) to build upon. Therefore the “Bouillabaisse” turned into gumbo, and “Paella” developed into jambalaya . With that in mind, here is a delicious mouthwatering potato salad, perfect for summer days, employing the standard Creole trinity. It is not your mother’s potato salad, unless she is a Creole cook. Cook the whole potatoes, peeled or not, about 15-20 minutes. Do not overcook; they should be a little firm, not soft. Let the potatoes cool. Cut the potatoes into ½ inch slices. Put into a big bowl. Add the bell pepper, celery and white onion. While the potatoes are still warm, mix them with the vinaigrette and hot sauce. Marinate this for 60 minutes or more at room temperature, stirring from time to time. When ready to serve, toss the potato mixture with the green onions and parsley. Mix all but olive oil in a medium sized bowl. Gradually whisk in the oil. I am going grocery shopping tomorrow, so I wanted to check out your latest offering. I have not had much luck at altitude with potatoes. Though your recipe sounds delicious! Miss Lynda: Garlic is good (except in chocolate cakes yeah) as a soup. Priya Sreeram: You will love, love this potato salad. Miss Susan: Do not despair. If you use a pressure cooker, potatoes, even the medium whole ones, cook quickly. In a regular pot, at high altitudes, they will take longer, but just probe with a fork to see if it's done. Important that you start in cold water. That was nice trivia about trinity!My hubs loves creamy potatoes especially a potato salad done like this one ~ can't wait to try it! PS: Sorry you are having trouble viewing the recipe on my site. Seems to be working ok for me, do let me know if it doesn't get resolved soon. Aipi: Thank you for your kind words, and yes I was able to view the complete Massaman curry. Torviewtoronto: I'm going to make that stew next monday, and your presentation was exquisite. Thanks for your visit. Thanks for the information on trinity ingredients! It was interesting to find out what combinations there are from all around the world. Oh. My. Goodness. This was awesome. I feel so much smarter. I never knew about the holy trinities in cooking. Thanks!!! Golden Eagle: Thank You for visiting. Poddys: Glad to help. Live, love,eat. RaShelle: I am so happy you enjoyed it. Thank You. That sounds so yummy. I never thought of food as containing trinities, but now that you mentioned it, it makes sense to me. That food must be very rich. I'm loving the sound of this salad and especially the vinaigrette dressing. Would go well with bbq! This salad sounds delicious! I actually found your blog by visiting Kathy's. I'm glad I stopped by, you have some really great stuff here! Misha: This is a delicious salad, you will love it. Leovi: It has a rich taste for sure, but is not as rich as other potato salads. Fa L'Americana: Yeah, onions are found all over the world. There is an old tavern in New York City where some patrons eat raw onion slices on buttered bread. Nutschell: WELCOME HOME. Glad to hear from you. is ubiquitous in India , even if some Indians shun garlic and onion. And yes, this salad is perfect for warm weather bbq's. Maeve Frazier: This salad is delicious, I guarantee. I'm glad you stopped by. Kathy is very business right now writing a YA novel about a teen-age girl looking for her siblings in WWII England. People are quite taken with her childrens book - "Sh Sh Sh Let the Baby Sleep".